Nonwoven capacity and production demand (in-region demand and exports) in Southeast Asia is expected to continue to grow during 2018 – 2023 driven by favorable demographics, economic conditions, local and export market demand and increasing market penetration. Taken as a whole, the ASEAN 5 countries (Malaysia, Indonesia, Philippines, Thailand and Vietnam) are now estimated to be the third largest global market and among the largest global economies. In 2019, real GDP annual growth is expected to range from 3% in Thailand to 6% in Vietnam and the Philippines. GDP growth in Indonesia is estimated to grow 5% in 2019 and 4.5% in Malaysia. In comparison, GDP growth in China is expected to range from 4.5 – 6.3% depending upon the source in 2019. Global annual growth in 2019 is expected to be about 3%. Annual GDP growth is likely to ebb over time, however, as the aggregate economies in each country become larger. Attractive economic growth amongst the ASEAN five countries spurs has led to rising employment, higher productivity and wages. This in turn has driven increased consumption of disposable nonwoven products and other consumer goods. Increasing market penetration for disposable and durable nonwovens in Southeast Asia and China, where market penetration is still low, is a positive predictive factor for good nonwoven demand growth in both Southeast Asian markets and in their export markets as well. Nonwoven producers in the ASEAN fivecountries are expected to benefit from good export demand from China, Japan and other countries in and outside the Asia-Pacific region. The largest market for converted nonwoven products will be in hygiene end uses followed by nonwovens used in durable geotextile and other markets. Several global and regional disposable hygiene producers have converting operations in Southeast Asia of which some have recently expanded or acquired local regional capacity. These producers include Kimberly-Clark, Johnson & Johnson, Kao, P&G and Unicharm, who recently acquired DSG based in Thailand. Increasing converting capacity in Southeast Asia speaks to demand growth in the region and the region’s popularity as a manufacturing base for exports to other Asian locales. In 2019, nonwovens capacity in the region consists largely of spunbonded/spunmelt fine denier technology followed by carded staple fiber needlepunched and/or thermal bonded capacity, spunbonded polyester and medium denier spunbonded polypropylene needlepunched technology. Small but growing installations of other nonwoven technologies including carded air through bonded are also present. 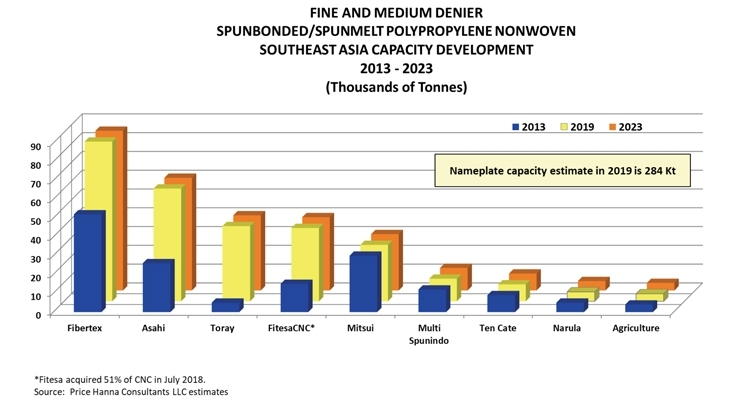 From 2013 – 2018, the installation of fine denier spunbonded and spunmelt polypropylene nameplate capacity in Southeast Asia grew an average of 14% annually from 143,000 tons in 2013 to 275,000 tons in 2018. Nameplate capacity of this technology increased to 32,000 tonnes in 2018 alone. In 2019, the nameplate capacity of both fine and medium denier spunbonded/spunmelt polypropylene technology in the Southeast Asia is 284,000 tons and accounts for about 7% of all global capacity in this technology category. Most of the largest producers of nonwovens in Southeast Asia utilize fine denier polypropylene spunbonded/spunmelt technology only and largely supply the hygiene market. Fibertex in Malaysia is the largest nonwoven producer in Southeast Asia in 2018 with capacity of 85,000 tons. Asahi (Thailand) commissioned a new line in 2018 and has 60,000 tons of fine denier spunbonded capacity in place at the beginning of 2019. FitesaCNC and Mitsui, both in Thailand, each have about 40,000 tonnes of fine denier capacity in 2019 and Mitsui in Thailand 30,000 tons. Spunbonded/spunmelt fine denier producers in Southeast Asia will remain heavily dependent upon exports to achieve acceptable levels of capacity utilization Disposable nonwoven demand is growing but remains quite small compared to installed capacity within the region. Unitika commissioned a 30,000 ton spunbonded polyester line in 2017 making it the sixth largest nonwoven producer in Southeast Asia. The line output will target carpet backing, geotextiles, roofing, automotive and other industrial applications. Ten Cate is the only producer of medium denier spunbonded polypropylene nonwovens in Southeast Asia. These nonwovens are needlepunched and supply the geotextile market and other related end uses. Ten Cate’s annual nameplate capacity is 9,000 tons and is unchanged since 1996. Producers of carded air through bonded nonwovens in Southeast Asia include Ocean Cash in Malaysia, JNC in Thailand and Daiwabo in Indonesia. In addition, Indorama’s JNC/ES FiberVisions operates a large staple fiber extrusion operation in Thailand which together with sister plants in Japan and China supplies bicomponent staple fiber throughout Asia.